And I should know, because my inability to listen properly has got me into a lot of trouble over the years! Oops. So *I* shall be coming back to this page often to study careful what Peter Murphy has to say about one of the most basic of communication skills: listening. Okay, firstly I have to say hats off to Peter Murphy - I think his thoughts on are some of the best on the Self Help Collective site, in my humble opinion anyway. Perhaps this is because my listening skills are not so great - I couldn't possibly comment! - but Peter really does show you how to improve one of the basic communication skills: that of listening. 4. Always be aware of body language. Hmm, that body language stuff is pretty tricky to me. Good job I'm going to learn about it via this website. 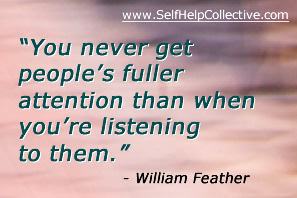 Again, if you actually care about what the person is saying it's going to improve your ability to listen. Put yourself in their shoes. And do this often. 10. Avoid cutting off before they have finished speaking. Ah, mea culpa - as they say in Latin. It means that I make this mistake far too often. It's rude. It's impatient. And it's just bad listening. Share this listening skills page - thanks!